7 − = two Required Please enter the correct value. Investors seeking to diversify portfolios with a steady income stream need look no further than dividend stocks. 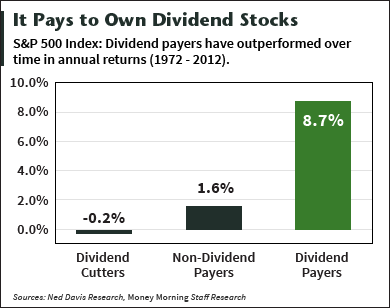 In addition to contributing a meaningful portion of a portfolio's total return, dividend payers tend to outperform non-dividend payers across market cycles and offer higher risk-adjusted returns, according to S&P Dow Jones Indices. Dividend-paying stocks also play an important role during periods of market volatility. While stock price returns can be either positive or negative, dividend income, by definition, is positive. "Therefore, dividends provide investors with the opportunity to capture the upside potential while providing some level of downside protection in negative markets," S&P writes. Following are the 23 dividend stocks that increased payouts during the week ending June 20. Alexandria Real Estate Equities Inc. (NYSE: ARE) upped its quarterly distribution $0.02 to $0.72 a share for a 3.74% yield. 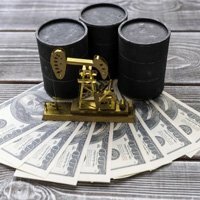 American Capital Senior Floating Ltd. (Nasdaq: ACSF) hiked its quarterly payout a dime, or 55%, to $0.28 a share. Apollo Residential Mortgage Inc. (NYSE: AMTG) raised its quarterly dividend $0.02 to $0.42 a share for a near 10% yield. Banco Bradesco S.A. (NYSE: BBDO) boosted its monthly payout 2.2% to $0.084 a share for a 0.54% yield. The Brazilian bank also declared a special $0.01-per-share dividend to shareholders of record July 7, payable on Aug. 8. Bowl America Inc. (NYSEMKT: BWL.A) increased its quarterly dividend 3% to $0.17 a share for a 4.4% yield. DTE Energy Co. (NYSE: DTE) sweetened its quarterly dividend 5.3% to $0.69 a share for 3.56% yield. The increase marks the fifth consecutive year of payout boosts from the Detroit-based energy giant since 2009. The average annual increase has been 5.4%. "Dividends have been a significant component of DTE's total shareholder return and dividend growth is a key factor in our ongoing investor philosophy," said Gerard M. Anderson, DTE Energy's chairman and chief executive officer (CEO). "Looking forward, we continue to target 5% to 6% earnings per share growth, with dividends growing in line with earnings."